Our Top Picks for Beginners series of articles is focused on showcasing some of our favourite instruments available to all you aspiring players out there. Some products are more beginner friendly than others, and have features that can be invaluable for learning. We want to make it as easy as possible for you to pick your first instrument and get you on your way to becoming a virtuoso in no time! In this particular article we will take you through some of the best options available for the beginner piano/keyboard player. The Yamaha P-45 is a great choice for getting started with piano, and is generally recommended by teachers for practicing. It features 'Graded Hammer Action' keys. This is what you would find on an acoustic piano, so the transition from lessons on an acoustic piano to practicing at home will feel seamless. The piano sounds are realistic and you also have a handful of other tones such as electric piano and strings on board. When it comes to buying a digital piano with fully weighted keys, things can start looking pricey pretty quickly. However, this particular unit is one of the most modestly priced digital pianos on the market, while still providing a great playing feel and realistic sound quality. We highly recommend it! The GO:Piano is an extremely portable, lightweight solution that sports 61 keys with an ivory feel. It features Bluetooth audio and MIDI. This allows you to play music from your device through the in-built speakers, which you can then play along with. This also means you can interact with Roland's free Piano Partner 2 app, which is fantastic for helping you learn with it's interactive games and learning tools. This is a great choice if you're looking for something you can take around with you easily, due to it's non-weighted keybed. Yamaha are well known for being able to provide quality equipment at all price points, and the PSR-E263 is a prime example of this. Most of us have started out learning on something similar to this item. This is an affordable keyboard with tons of sounds and backing songs on board. The PSR-E263 also features recording and an AUX input for connecting an MP3 player. This means you can record your performance and hear your progress, as well jam along to your favourite tracks. This keyboard is a great option for taking around with you, as it can run on batteries as well as mains power. This is a solid all-round beginner's choice! Expanding on the reliability and quality of the PSR-E263, the Yamaha PSR-E463 offers over 750 different voices, 235 accompaniment styles and sampling. You have a lot more control of the sounds of this instrument, and can add effects and modify the base sounds. While at first it may seem a bit more complicated than the PSR-E263, it's laid out in much the same way and is easy to get to grips with. If you're looking for a keyboard that will keep you learning and experimenting with sounds for years to come, this is a great choice! This is one of our favourite portable digital pianos here at guitarguitar! While featuring a straightforward layout, the keyboard action is very responsive and the sounds are really high quality. The Roland FP-30 features a fully weighted keybed, giving you a realistic feel that allows to go from an acoustic piano to practicing at home easily. The FP-30 features high quality piano, organ and strings sounds, as well as a few others. Because it uses Roland's Supernatural sound engine, it features very realistic tones. The Roland FP-30 also offers bluetooth connectivity, allowing you to interact with Roland's free Piano Partner 2 app and many more, such as Garageband or sheet music apps. Piano Partner 2 is great for learning with features such as games and flash cards. This also means you can stream audio through the speakers from a device, allowing you to jam along to your favourite artists. This is an excellent choice for beginners and more advanced players alike, and will last you for years to come. 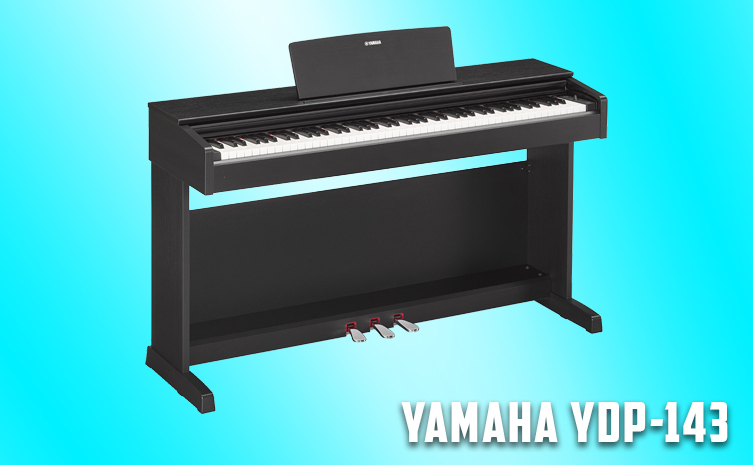 The Yamaha YDP-143 is an excellent option for the home. Sporting a handsome wooden cabinet, great playing response and very high quality sounds, this is a total bargain! The controls are extremely straightforward, while still giving you a solid range of sounds. You can also connect this to your computer or mobile device for use with Yamaha's music apps. There's even a free songbook in the box to get you going. This is a great choice if you want a high quality piano that's easy for beginners to navigate and looks amazing in the home. That about wraps it up for our top picks for beginners on keyboards and pianos. We just want to talk about one more thing, and that's accessories to complement your new equipment! Have a look below for some advice on items that will definitely come in handy on your musical journey. You're going to need something to keep that shiny new digital piano or keyboard off the coffee table! That's where a keyboard stand comes in. For lightweight portable keyboards, a single braced X stand will provide enough support. Digital pianos weigh a fair bit more and are best paired with a double braced X stand. Double braced stands can withstand a lot more weight than their single braced counterparts and are ideal for heavier keyboards. Check out our range here! While it can be extremely rewarding to hear a loved one perform on a musical instrument, some of us might not all have the patience to hear the same 8 bar section of 'Für Elise' over and over on a Sunday afternoon. This is where headphones come into play. You can practice to your hearts content and really get those notes right before performing your latest masterpiece! We recommend Roland RH-5 headphones as a comfortable option with a great sound! A comfortable, height adjustable keyboard bench is always handy to have. You don't want to end up sitting on a chair from the dining table for 4 hours while you hone your skills. The TOURTECH TTBE-KA20 is a great choice for getting started with, although you can view our full range of options by clicking here! While we hope this article gives you the knowledge you need to choose the right keyboard or piano for you, we understand you might still have some questions. Our friendly staff are very knowledgeable and will be happy to advise on anything that you're unsure of. Please get in touch if you have any questions!